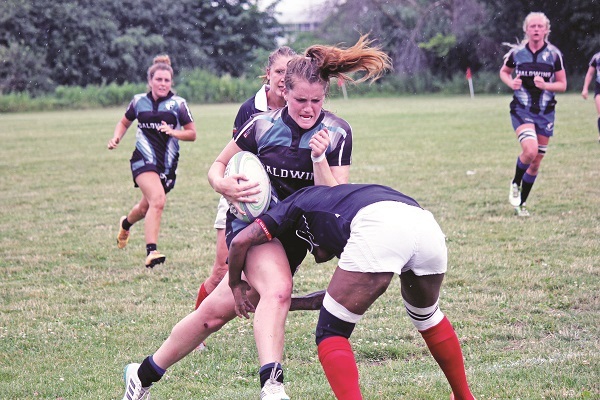 Putting together one of their deepest rosters in years, the Aurora Barbarian women have quietly put themselves in good position to return to the top of the Ontario Women’s League rugby throne. Within reaching distance of clinching the second-place spot in the competitive Eastern division of the premiere rugby league, the Barbs fell just short of victory against the Toronto Scottish on Saturday. A late try put the Scottish over the Barbs, who notched five tries to Toronto’s six, with the final score reading 36 – 33. Despite the loss, Aurora remains in second place in the division with just a couple weeks left on the regular season schedule. The Barbs last lifted the OWL trophy in 2016, defeating Toronto in the championship game, before falling to them in a rematch last season. Though looking to return to form against Waterloo County in a crossover match on Saturday, four members of the senior squad have bigger fish to fry beyond their home club: donning the Ontario blue at this weekend’s Canadian Rugby Championship. The highest-tiered tournament among the national rugby circuit, Ontario will be represented by Barbarians Emily Barber, Arielle Dubissette-Borrice, Lori Josephson, and Saffara Whiteley-Hoffelner, tied with the Guelph Redcoats for the most club representatives. With sixteen teams representing all ten provinces, Ontario will face off against Quebec, the Prairie Wolfpack, British Columbia, and the Nova Scotia Keltics Wednesday through to Sunday. Barber and Josephson’s experience level extends even further: both have donned the red and white for Team Canada, notably Josephson representing her country at the 2017 Rugby World Cup. Sennik said she will look to these players as leaders during the week-long event. Ontario enters the tournament as the favourites, having swept through the competition in last year’s tournament to claim the 2017 title. Dubisette-Borrice was not on that winning roster, though her experience extends far beyond most of her teammates in this year’s tournament, spending years on the international circuit in both the sevens and fifteens programs. This week, dozens of international and national scouts will be on hand at the event in Saskatoon, Saskatchewan to look for the next wave of Team Canada talent, including that of Whiteley-Hoffelner, who was named the OUA’s Rugby Sevens Player of the Year while playing for the Seneca Sting in 2017. Tournament director Ken Goodland said in a press release the tournament is a “stepping stone” for players to make the transition from club and university rugby to the national stage. All four players will be eligible to return to Barbarians on July 28 when they take on the Toronto Saracens in a battle of Eastern division heavyweights.